Boeing's design and manufacture of its cutting-edge 787 jetliner is safe despite the many problems encountered since the plane's rollout, including a fire that forced a redesign of the its batteries, according to a report issued jointly Wednesday by the Federal Aviation Administration and the aircraft maker. The yearlong review concluded "the aircraft was soundly designed, met its intended safety level, and that the manufacturer and the FAA had effective processes in place to identify and correct issues that emerged before and after certification," the agency said in a statement. The 787, Boeing's newest and most technologically advanced plane, has been hit by a variety of technical and safety glitches since its launch in 2011. It is the first airliner to make extensive use of lithium-ion batteries. Since the FAA didn't have safety regulations for those batteries as installed equipment in planes when the 787 was designed, the agency and Boeing jointly developed the special safety conditions the plane's battery system should meet. After the battery failures, the FAA was criticized for relying too heavily on designated Boeing employees to ensure the safety of the plane's design and manufacture. "The (report's) findings validate our confidence in both the design of the airplane and the disciplined process used to identify and correct in-service issues as they arise," said Boeing Commercial Airplanes President and CEO Ray Conner. A National Transportation Safety Board investigation into the battery fire in Boston is still underway. Wednesday's report was not intended to address the battery's design, but rather the overall safety of Boeing's design and manufacture of the plane and the adequacy of FAA's oversight. 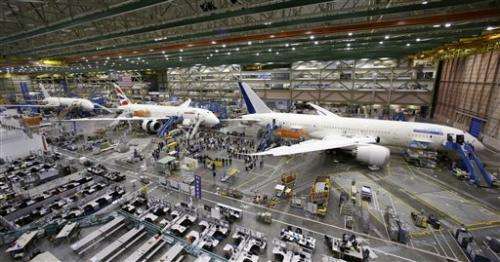 The report recommended that the FAA make changes to its oversight of the safety certification of new planes to take into account "new aircraft manufacturing business models." Another report recommendation is that the FAA revise its production approval procedures "to more fully address complex, large-scale manufacturers with extended supply chains." "The review team identified some problems with the manufacturing process and the way we oversee it, and we are moving quickly to address those problems," Huerta said.